The Hyundai Kona Electric is the automaker's compact crossover SUV with up to 258 miles of range. It initially will be available in a limited number of states. Like the name suggests, it's related to the Kona crossover that is available nationwide. Essentially a tall-riding hatchback, the Kona Electric skips the all-wheel-drive system offered on the Kona in the name of efficiency. The Kona Electric competes with a small number of affordable electric vehicles including the Ioniq Electric, Honda Clarity Battery Electric, Fiat 500e, and Chevrolet Bolt EV. 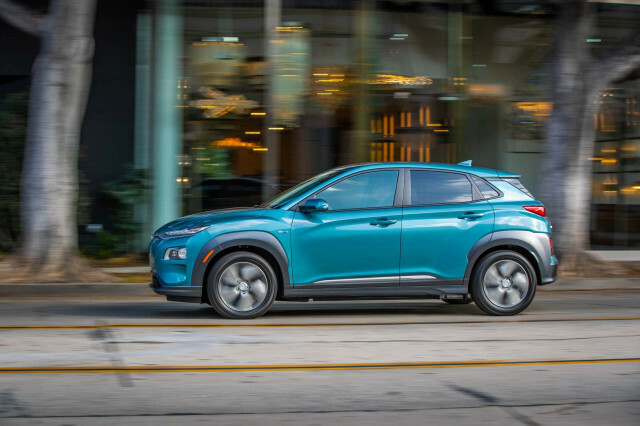 In 2019, the Hyundai Kona and Kona Electric were named the North American Utility of the Year. With the Kona Electric, Hyundai offered an incremental step toward a mass-market EV beyond its Ioniq Electric. The Kona Electric offers up to 258 miles of range from its 64-kwh lithium-ion battery, far more than the Ioniq Electric's 28-kwh power supply. Charging times for the Kona Electric range from less than one hour on a rare Level 3 fast charger up to nearly 10 hours on a conventional Level 2 charger, which many EV owners typically install at home. The Kona Electric relies on propulsion from a 201-horsepower electric motor driving only the front wheels. 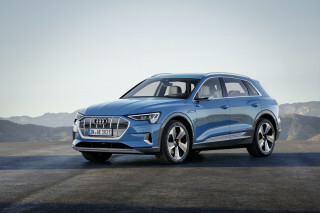 The electric drivetrain means there's no conventional transmission and just a single gear. Four-wheel independent suspension should smother road imperfections in the Kona Electric, and batteries underneath the low floor help keep the Kona Electric planted on the road, but add significant weight. The Kona Electric largely looks identical to its gasoline-powered counterpart although it receives a unique nose, different wheels, and new rear end all shaped in the name of efficiency. The Kona Electric sports the same tall ride height as the Kona, although we hesitate to call either one a crossover—let alone an SUV. Its 19.2 cubic feet of cargo space is more than a sedan, but also more in line with a hatchback. The Kona Electric is available in three trim configurations: SEL, Limited, and Ultimate that largely mirror the trim levels offered on the gasoline-powered Kona. All Kona Electrics feature 17-inch wheels, forward-collision warnings with automatic emergency braking, blind-spot monitors, automatic headlights, Bluetooth phone connectivity, two USB outlets, heated front seats, and Apple CarPlay and Android Auto compatibility. Stepping up to the Limited trim level adds leather upholstery, power-adjustable driver's seat, LED headlights, premium audio, wireless cellphone charging mat, and a sunroof. The Kona Electric went on sale in 2018 and is available in a limited number of states including California, Oregon, and other states with strict zero-emission vehicle standards, though Hyundai says dealers nationwide may order the vehicle for any customer.